Stipulated by many High Street Retailers, the Europa Grade 2 safes, offers a very high level of cash security protection. 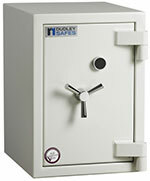 Europa Grade 2 safes have been designed to meet the stringent requirements of the European grading test safe standards. Heat-activated door seal is fitted as standard, for added fire protection. Bolt work arrangement is 3-way moving with fixed rear dog bolts, all bolts being 32mm dia. Standard locking as supplied is by a single 9 lever double bitted key lock with live and dual interconnected passive relockers.